Beautiful capture. I was never sure what the proper name of the butterfly was. Thank you for telling us what it is. Beautiful photo! 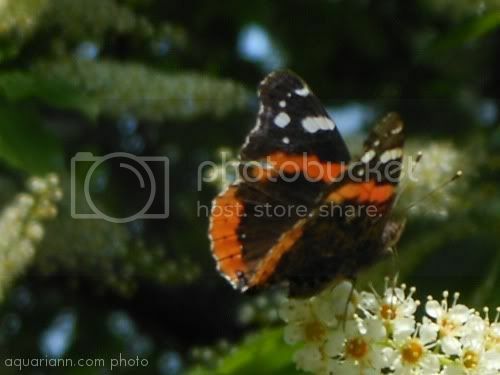 Did you have swarms of the Red Admirals last week too? Antonette - I didn't know their name, either, until the local newspaper wrote about them yesterday. Yes, Stacey - the migration was magical. There were dozens fluttering around me while I stood under that tree last Friday. Wow! Such an amazing and beautiful picture! You captured it very well. I love the colors and composition. Definitely one that I would frame! Thanks for linking up and your comments again this week. So beautiful! I'd like to plant flowers that attract butterflies this year. I love this shot! Beautiful butterfly, I love the tiny white flowers, too. That is so pretty! Thanks for sharing and having the linky. Lovely shot. Looks like butterflies I have seen around here, not sure though. I also love the quote. It does seem that way. I went for a walk with my daughter and granddaughter to see a neighborhood butterfly which astoundingly had literally hundreds of butterflies fluttering around bushes with purple flowers, Like aircraft more kept flying in, hovering and landing to sip nectar. I love that quote! Aren't butterflies/flutterbys so cool? My oldest just learned about butterflies in school. I love butterflies! Beautiful photo! I just saw one just like that a few minutes ago. I love flutter by! great shot. Beautiful butterfly!!! Happy Wordless Wednesday!! Oh my gosh, what a beautiful butterfly! I love this picture! I never thought of a butterfly that way, but it is a nice visual. Nice capture! What a great photo of the butterfly! They are so hard to capture in pictures. What a wonderful shot! The little flowers are so sweet too. I loved the quote as well.